Fine C15 panels and fragments, of which the best can be seen in the E window of the N chapel with nine scenes from the Passion: the Entry to Jerusalem, the Washing of the Disciples’ feet, the Last Supper, the Agony in the Garden, the Betrayal (with St Peter and the High Priest), the Scourging, Judgement Before Pilate, the Via Dolorosa, Crucifixion, Entomb¬ment, Harrowing of Hell; below are groups of donors and their families. Over in the SE chapel are the remains of a Tree of Jesse with part figures of David, Solomon, the Virgin Mary and Jesse’s head. 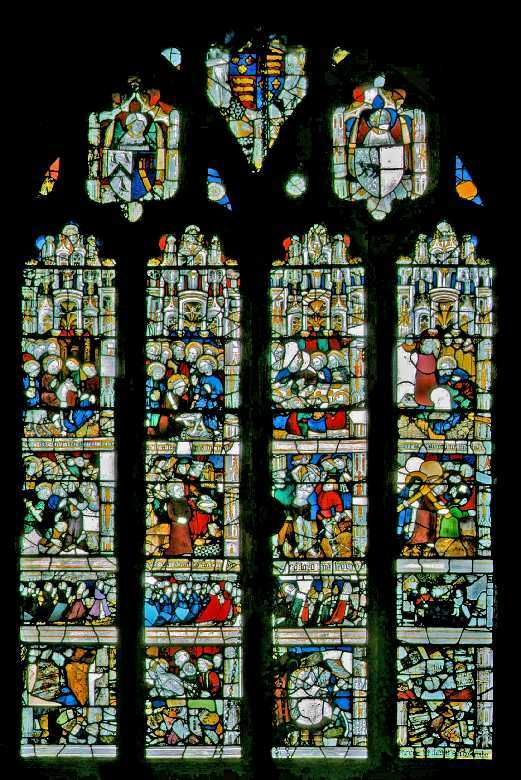 Fragments in the E window include St Michael and St Laurence.